Climbing is not a sport. There is no judge and it has no written rules, for they lie in the common sense and the ethics of those practicing it. The unwritten rules of this non-sport stem from technological innovation, from progress and the vision of the climbers themselves; over time, fine-tuning their skills and constantly raising the bar of passable obstacles, they led this activity beyond boundaries which were unknown to them, as well. La Sportiva technical consultants and collaborators at the time. They were at the forefront of this shift in the technique and manner of climbing, at the same time giving precise indications on how climbing shoes had to be modified and manufactured. Up to then, climbing shoes mainly had to be durable, offer support and protect the foot of the climber; from that moment on, it was clear that their main task was to grant the highest possible level of performance. These men and women stemmed from the mountains and their background was the wild and instinctive mountaineering of the Dolomites, featuring crucial movements of brittle rock, their credo being that a fall was simply not contemplated. Ever. Up to then, falling while climbing had to be avoided like the plague. Climbing on the more reassuring terrain of the valleys below, instead, allowed them to reach their technical limits and enjoy this experience in a new, playful and free manner. Climbing on the Spiaggia delle Lucertole in Arco meant carrying the values, the ethical vision and the rigour of climbing in the mountains and of mountaineering with them, while at the same time leaving the risks and limitations of big-wall mountaineering, such as the Dolomites, or mountaineering at altitude behind. Soon, that small group of mountain people, dragged away from the Dolomites, discovered a new way of climbing on limestone single-pitches, equipped from above, where they only had to push themselves beyond their physical capabilities, until a series of individual, unique, really tough movements allowed them to find a solution to seriously hard problems. Those tight-fitting, light climbing shoes possessing a magic sole, as well as safe protections, brought about technical progress. To begin with, it was not enough to be mountaineers at the crag: you had to become an athlete and train. In the Sarca Valley you had to be a daredevil, a juggler, an innovator and climbing was something new. You had to smear your foot on the holds as opposed to resting them on the shoe edge, as if you were going up a ladder. Climbers used their soles and adopted friction climbing, as well as using the inner and outer part of their feet, and not their tips only any longer. Heinz Mariacher and Roberto Bassi punched a hole through the ultra smooth Swing Area wall with a hand perforator for the first time in 1983. From that moment on, protections at a crag would have been put where nature allowed to climb free, with one’s own strength alone, and not only where you could place a piton. A decisive moment, a cultural revolution was taking place. From then on, climbing equalled going up with one’s own strength. Other walls were bolted thereafter, such as the famous Spiaggia delle Lucertole, Massone and San Paolo. The routes grew in numbers. «It was not only a matter of overcoming the fear of falling. It rather meant entering a new dimension of climbing, considering mistakes as part of the game and not a fiasco. Climbing at a crag did not require us to keep within the boundaries of infallibility; instead, it encouraged us to go beyond our limits and put ourselves out there. We had to make some attempts, try and try again, without ever feeling discouraged. The impossible became possible thanks to practice and training. We had invented the difficulty game and accepting the chance of a fall, if we aimed at improving, required a shift in mentality. It was good to know that your life was not at stake, should a fall happen. That was a different game. You only needed to think out of the box, accept the facts, that climbing could also be a game and didn’t only stand for heroism or a conquest». This vision, this new way of going up revealed itself as brand new in Italy. Arco became an immense rock playground, which could only be matched by few other areas in France, England and the United States, in the Yosemite Valley back then. The influence received from those areas, from the climbers, the techniques and products stemming from there played a leading role. A fully-fledged revolution in the Sarca Valley was the outcome of all this. Placing the protections closer and closer to start with and then the comparison with climbers from different backgrounds who had come to Arco to climb, contributed to erasing the last shred of alpine memory, still embodied in that game. Climbing slowly shifted from free to sport, making a move from free-climbing to sport-climbing; back then, we still couldn’t envisage that, only a decade or so later, another phase would take place, the one of indoor-climbing. That aura of adventure and the unknown that was part and parcel of any venture into the vertical world slowly disappeared. 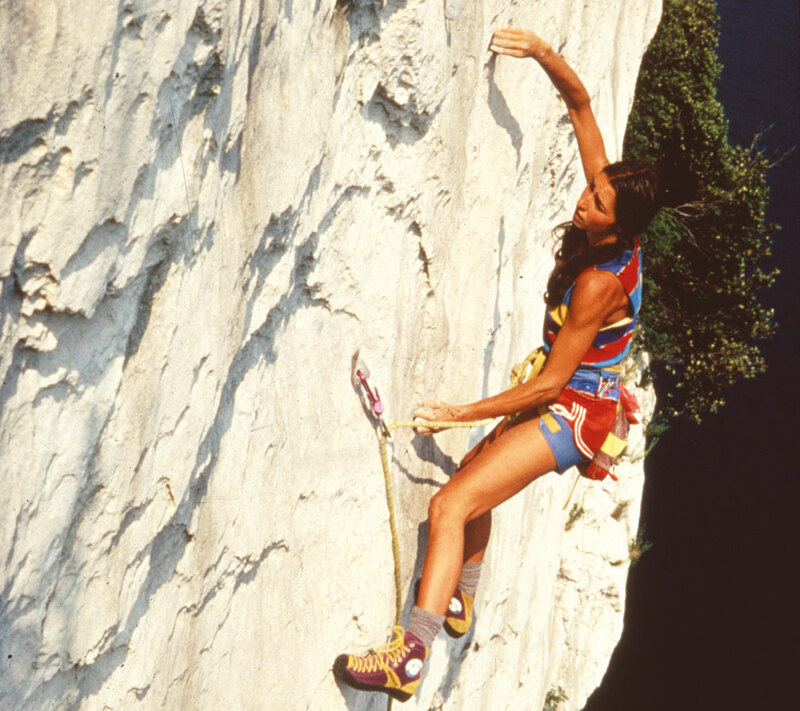 Climbing at the bottom of the valley relentlessly transformed into sport climbing, its aim that of raising the bar and looking for bigger and bigger challenges. The limits were no longer there, or rather, they were there precisely to be overcome: that was part of the game. Because of its crags, Arco became the cornerstone of world climbing in the following years, as did Trentino, in view of the most famous climbing shoes in the world, manufactured in Val di Fiemme and used by the best climbers on earth. The Germans came first and then others arrived from far and wide, wanting to face that technical, refined climbing fashion which was necessary to overcome smooth limestone slabs. Thanks to the climbing taking place down below, that touristic phenomenon we now call ‘outdoor tourism’ started to take shape. Tourists and holidaymakers, previously dotted around the lake shores, were slowly replaced by climbers first, then sportspeople and lovers of the outdoors, as well as families. The value and the impact that this revolution would have brought about in the decades that followed was most probably not fully grasped by local entrepreneurs and neither the Province of Trento. 1985 and 1986 marked a turning point for what would have quickly become a sport discipline. A climbing competition had taken place in Bardonecchia in 1985, on the Parete dei Militi, a rocky wall: the first of its kind. This competition, called Sportroccia, moved to Arco, with a renewed edition in two stages, the following year, which would have welcomed competitions in the years to come, as well, displaying an organisation and a style that still had to be invented. The event was put in place with a bang. The crowd that gathered to see the best climbers in the world had no idea of what was awaiting them, with the exception of the crags they were going to climb. Climbing had been practiced far from prying eyes, in the silence of the mountains for decades. Up to then, climbers had been silent, reserved folks, while they were now cherishing the joy of being together, discovering the flat areas at the base of the walls, in addition to the vertical ones. Climbing did not only equal solitude and remote places any longer. It went from being restricted to the two rope partners to being an individual sport, undertaken in pairs, chiefly on single pitches. Those years entailed big doubts and major changes. You did not exactly know how to watch competitions back then: spectators were asked to be fully silent while the athletes climbed the routes, as is the case in Wimbledon today. Rock Master in Arco, which replaced Sportroccia, was - and still is - akin to Wimbledon. These days, people scream and shout during the most relevant phases of the competitions, or the crux, encouraging athletes as if they were at a football or basket match. At the time, they watched the performance and kept quiet. Right then, thanks to the first competitions in Bardonecchia and then Arco, athletes from regions other than Trentino, both in Italy and abroad, entered the La Sportiva Team. 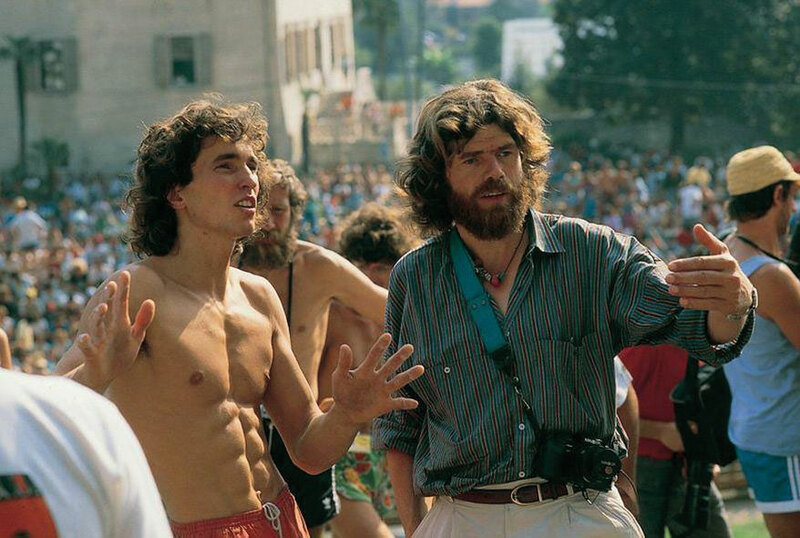 Riding the wave of success of the competitions, other top level climbers came to Trentino, giving rise to a virtuous circle, adding participants to the restricted circle of pioneers entailing Manolo, Roberto Bassi, Luisa Iovane and Heinz Mariacher. French, American, Russian and German athletes became part of the team: they gave visibility to the shoes and the climber-spectators, who had gone to Arco to see the competitions, wanted to buy the most up-to-date models from the first pro shop in the village. The La Sportiva climbing shoes featured a bold look and an innovative communication, with a slogan aiming at the visionary ‘Climbing on the Moon’, experimenting with a previously unseen gamut of colours. In a mountaineering world where red, blue, natural colours and leather boots prevailed, La Sportiva sported violet and yellow with the Mariacher models, later the even bolder pale blue and fuchsia of the revolutionary Mega and Kendo models. The dream of a small circle of visionaries became a movement, which brought about a proper revolution. As we all know, revolutions hint at the need for change. That’s what happened in Arco back then: a momentous change. There started a process which would have transformed the gear, the shoes and the way we climb forever, even more so our idea of performance, of mountaineering and our manner of relating to other enthusiasts like us. We moved from the concept of rope party to that of a team. That was a unique, magical, exceptional moment. Those were the days.